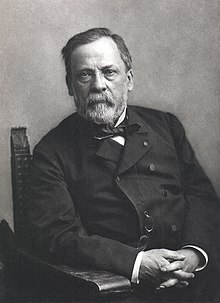 Louis Pasteur (French: [lwi pastœʁ]; 27 December 1822 – 28 September 1895) wis a French chemist an microbiologist renained for his diskiveries o the principles o vaccination, microbial fermentation an pasteurisation. He is remembered for his remerkable brakthrous in the causes an prevention o diseases, an his diskiveries hae sauft mony lifes iver syne. He reduced mortality frae puerperal fiver, an creautit the first vaccines for rabies an anthrax. His medical diskiveries providit direct support for the germ theory o disease an its application in clinical medicine. He is best kent to the general public for his invention o the technique o treatin milk an wine tae stap bacterial contamination, a process nou cried pasteurisation. He is regairdit as ane o the three main foonders o bacteriology, thegither wi Ferdinand Cohn an Robert Koch, an is popularly kent as the "faither o microbiology". Pasteur wis responsible for disprovin the doctrine o spontaneous generation. He performed experiments that shawed that withoot contamination, microorganisms coud nae develop. Unner the auspices o the French Academy o Sciences, he demonstratit that in sterilised an sealed flasks naething iver developit, an in sterilised but appen flasks microorganisms coud growe. Awtho Pasteur wis nae the first tae propone the germ theory, his experiments indicatit its correctness an convinced maist o Europe that it wis true. The day, he is eften regairdit as ane o the faithers o germ theory. Pasteur made signeeficant diskiveries in chemistry, maist notably on the molecular basis for the asymmetry o certaint creestals an racemisation. Early in his career, his investigation o tartaric acid resulted in the first resolution o whit is nou cried optical isomers. His wark led the wey tae the current unnerstaundin o a fundamental principle in the structur o organic compounds. He wis the director o the Pasteur Institute, established in 1887, till his daith, an his bouk wis interred in a vaut aneath the institute. Awtho Pasteur made grundbrakin experiments, his reputation becam associatit wi various controversies. Historical reassessment o his notebeuk revealed that he practiced deception tae owercome his rivals. ↑ Feinstein, S (2008). Louis Pasteur: The Father of Microbiology. Enslow Publishers, Inc. pp. 1–128. ISBN 978-1-59845-078-1. ↑ Hook, Sue Vander (2011). Louis Pasteur: Groundbreaking Chemist & Biologist. Minnesota, US: ABDO Publishing Company. pp. 8–112. ISBN 978-1-61758-941-6. ↑ Ullmann, Agnes (August 2007). "Pasteur-Koch: Distinctive Ways of Thinking about Infectious Diseases". Microbe. 2 (8): 383–7. Retrieved December 12, 2007. ↑ Geison, Gerald L (1995). The Private Science of Louis Pasteur. Princeton (N.J.): Princeton university press. ISBN 0-691-01552-X. ↑ Anderson, C. (1993). "Pasteur Notebooks Reveal Deception". Science. 259 (5098): 1117. doi:10.1126/science.259.5098.1117-a. PMID 8438162. This page wis last eeditit on 7 Dizember 2018, at 22:23.